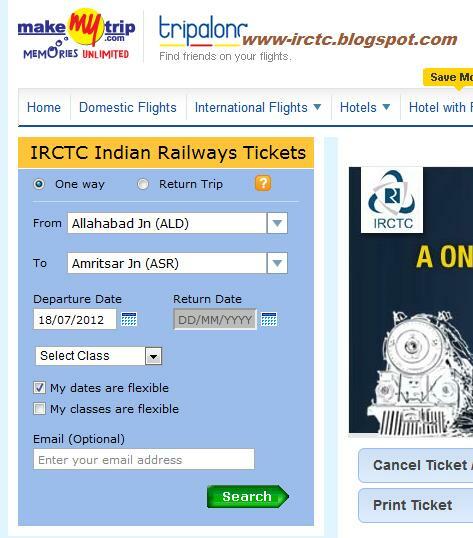 There are many alternative way of train ticket booking websites are available instead of IRCTC. Following are the details of alternative train ticket booking website. Now ICICI Bank allowed you to book the IRCTC Ticket online faster way. ICICI also provides good user interface facility to book the IRCTC Ticket also. To Book the train ticket online visit IRCTC ticket booking via ICICI BankI have seen lots of users can’t able to access the IRCTC Online Booking website due to some network or hey load issue. Normally they are getting error like ” This Web Page is not available “. When you have facing this kind of issue try to log on the following website that authorized by the IRCTC to book the IRCTC Online E- Ticket or I – Ticket. Following are the list of websites that able to use as a alternative to the IRCTC Official Online Booking website. Clear Trip is most commonly used alternative website for IRCTC Online ticket booking. This also allowed us to book the Air Ticket booking too. This is most user friendly as per our user review. I think most of them still using the same but for the new ones I have posting this. But keep in mind this site won’t able to book the ticket during the restricted time period on the Morning. So for getting tatkal travel ticket better to user IRCTC Website itself. For booking the ticket through the Clear Trip please click on the following link Clear Trip Online Reservation. 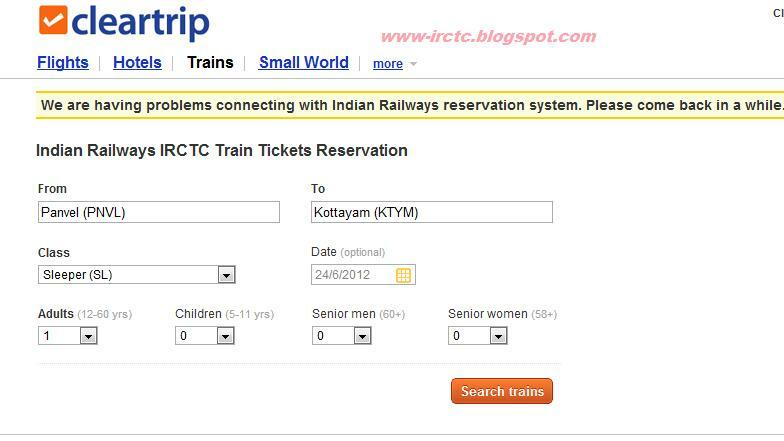 This website also can able to book the IRCTC Rail ticket for the I-Ticket and E-Ticket. This also apply the morning time restrictions. Keep in mind these sites are taking some extra money for booking the Indian Rail Online Ticket booking of I-Ticket and E-Ticket. Did you find any other alternative website like these then please replay back your comments, so that everybody will know. Now Four post offices in Mumbai Chembur, Dadar, Mandvi and Girgaum—will have the railway reservation facility from Monday. These will be inaugurated by Union minister of state for communications Gurudas Kamat. Union minister of state for communications and IT, Gurudas Kamat launched the railway reservation system for providing tickets at four post offices in Mumbai on Monday. “The project would not only reduce the queues at railway stations but also reduce load at railway centres,” Kamat said. Kamat has selected 5,000 post offices in the country for this scheme, of which 103 will be in Mumbai.